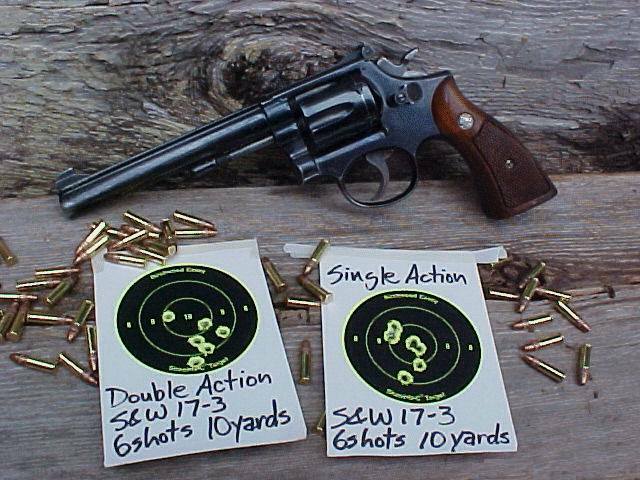 Long ago, Smith & Wesson began calling a select few revolvers Masterpiece. In fact, they had the audacity to name one of their revolver packages the Combat Masterpiece. That's a hell of a name. Combat Masterpiece. Presumptuous as hell, it sounds like it ought to be stepping into a professional wrestling ring wearing a lycra mask and a feather boa. What is this Combat Masterpiece? After WWII, Smith & Wesson introduced an improved .38 Special revolver, designed for target shooting. It was designated the K-38 Target Masterpiece. Very quickly, law enforcement, and particularly the FBI asked Smith & Wesson to shorten the barrel to four inches and mount a Baughman Quick Draw front sight in place of the Patridge sight. This new variation quickly took over the police shooting competitions of it's day, and became the favored carry gun of many officers. It was dubbed the Combat Masterpiece. My old weathered K-38 Combat Masterpiece is pictured at left. This is an imminently shootable gun. I consider it to be my finest shooting wheelgun. The trigger is absolutely incredible. 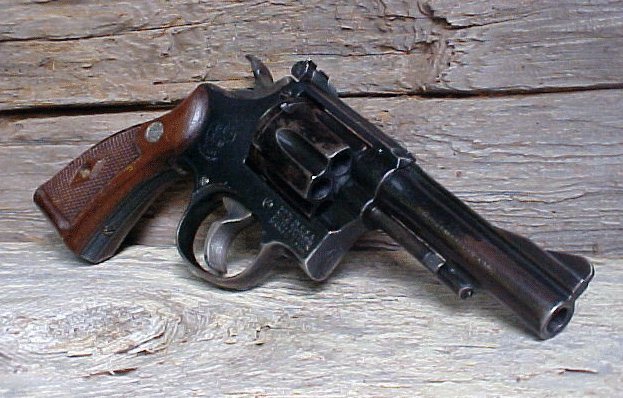 The K-38 designation is simply that of a pre-Model number K frame .38 Special Smith & Wesson. The K-38 Combat Masterpiece became the Model 15 in 1957. The stainless Model 67 was also known as a Combat Masterpiece. There was also a .22LR caliber Model 18, which was known as the K-22 Combat Masterpiece. By contrast, the Smith & Wesson Target Masterpiece had a six or eight and 3/8 inch ribbed barrel coupled with an adjustable rear sight. Over the years, the front sight varied on the Target Masterpiece, but it was usually a Patridge type sight. Serrated front and back straps were standard on the Target Masterpiece. It was available in .22LR as the K-22 Target Masterpiece and later Model 17, and .38 Special to make up the K-38 Target Masterpiece and later Model 14. To make matters worse, there are also heavy lugged barrels on some Target Masterpieces, as well as a K-32 Target Masterpiece/Model 16. Pictured above is my Model 17-3 Target Masterpiece. The Masterpieces of Smith & Wesson are not fancy. They do not have light rails nor mounts for red dot scopes. They are not trendy. They are classic. Many say that the Model 27 in all it's variations and lucious liquid blue finish is the pinnacle, the Mona Lisa, of Smith & Wesson revolvers. The checkered sight rail and jewel like blue of the Model 27 is indeed beautiful, baroque. There is, however an undeniable beauty in the simplicity of design, in the work of Mies van der Rohe and his contemporaries. Less is more. The Mona Lisa is not the only artistic masterpiece ever painted, and the Masterpieces of Smith & Wesson are indeed masterful renditions of purpose driven revolvers. They well deserve the title of Masterpiece. Them wheelguns 'r finer than frog's hair split four ways. They are beautiful. They're what I always picture when I think the word "Revolver". Once apon a long time ago I was looking for a short M-19 and couldn't find one anywhere. I found a M-15 shorty and discovered that it was the most accurate and sweet revolver I'd ever handled. Hey, I LUVS ma Smithy's ! hey, I Luvs ma Smithys ! I just purchased a S&W Mdl 15-3 (chrome) at our Gun Show yesterday. It was "dirtied up" but I gave $ 300.00 for it. After removing the cylinder and grips today and doing a thorough cleaning job, you would believe this beauty was absolutely NIB. (I also got the proginal box and S&W documentation with it). If anyone can "date" this wheelgun for me, please email me at junglerat@triad.rr.com. This is one sweet piece. I just got back from the range where I showed a retired, recently widowed lady how to shoot. We used the Combat Masterpiece her husband bought for her years ago. To get started, she borrowed my K-22 (a perfect match for her Masterpiece). After about 24 rounds of that, her hand started getting sore. Her first shot with the .38 landed square in the forehead of a zombie target. All her other shots landed right where they were supposed to. We stopped before her hands gave out. No problems. No malfunctions. I suggested she run a 6-12 rounds through the gun every few months and don't worry about cleaning it. That trusty Smith and Wesson Combat Masterpiece will be her faithful protector for the next 20 years. A great gun! it,s a patridge, not partridge front sight. common misteak. , oh did I spell that wrong? I just purchased a 15-4. I carried this type as an Air Policeman in the late '60's and it's a pleasure to hold one again. I believe this is one, if not THEE best revolver S&W made. It truly is a masterpiece. The accuracy of this revolver keeps me honest on the range. Only the shooter misses, not the gun. Thanks for the great article. If anyone has an extra 15 they don't want just Email it to me. What a great description of the Model 15. I just purchased a 15-4 after a couple of years looking. I carried a 15 in the Air Police and have always wanted to own one. It is a pleasure to shoot, I have both Hogue and the original grips. It brings back fond memories and provides a real thrill on my home range. This gun proves that anything outside the bull is the shooter's fault. Makes an honest shooter out of me. Xavier, I have enjoyed your comments on the K-38, I believe I hav e posted a comment here before about having a special love for the weapon. I had a 1950 K-38 but it is surety for a loan right now and I don't know if I can get it back (SOB!!). If you want to, go to YouTube and search for "Smith and Wesson K-38 Combat Masterpiece: The Prince of Revolvers" for a look at mine I have had several people tell me the Colt Python is "the prince"; but I always say that the K-38's history in law enforcement makes it the prince. The Python is sorta the Liberace, IMHO. Mr. Norman, you are correct; it is the Smith & Wesson "K" frame revolver that constitutes the Prince of Revolvers. I prefer the earlier versions of the Combat Magnum (later model 19) but the Military & Police (later model 10) is very useful as well. The K frame, adjustable sighted .38 Specials are delightful. The Python is closer to Liberace; except Liberace could actually play the piano, for all his self-mocking hype. I think of the Python as closer to Angie Dickinson; very pretty at which to look, nothing there when examined.